The Technology Transfer Gap between Academic Research Organizations like Universities, Fraunhofer and Max Planck Institutes etc. and Industrial Applications is continuously increasing. Industry is insourcing technologies at very much later stages towards market introduction than it used to; Academic Research has to stop even commercially promising projects due to a lack of financing or a potential mismatch of later stage works to their research mandate. 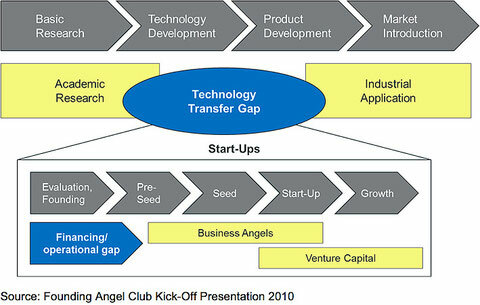 Start-Up companies can master to close this gap, especially when technological experts from the Academic Research Organizations are supported by Founding Angels with deep industry knowledge and strong business contacts in the corresponding target markets.